Now that it’s October, it’s fair to start sharing Halloween picture books, right? Here’s a pretty new one, just published this August. Opening: “The wind blew, the leaves fell, and a tiny seed hid in the garden. 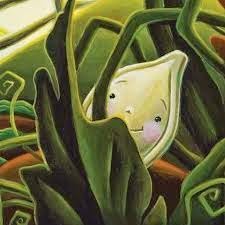 “Boo,” the seed said to a leaf rolling by. “You’re not scary at all,” the leaf said. 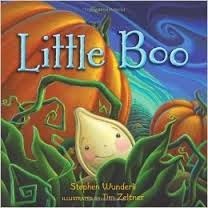 Brief Synopsis: A little pumpkin seed tries hard to be scary but he just can’t seem to scare anyone – not the leaves or the grubs, not the snowflakes in winter or the bees in spring! “Be patient,” the wind tells him, “you’ll be scary soon enough.” But it’s awfully hard to wait! And although I haven’t been posting on Mondays, be sure to visit this coming Monday for an important announcement! So sweet! I love the little seed. How cute! that pumpkin seed does indeed look ghosty and almost scary. I can guess why the little seed isn't scary . . . Yet! Thanks for the PPB pick. What a charming little face. I love it. And the entire concept. As far as Halloween stories go, it's a winner! I like mine sweet and not scary. . . So good to be back with PPBFs! Aaww! So sweet! I want to read this one. I can't believe it's Halloween time already. Where did the time go? A pumpkin seed! That's brilliant and sounds super cute. My library list is going to stack up again. I've made two trips to the library this week grabbing the past two weeks PPFB. Enzo and I have been very happy with the selections. Lots of fun 2014 books. 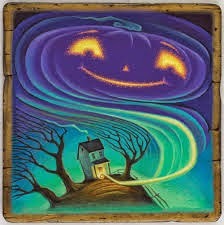 Now that my kids are pretty much grown, Halloween has not much meaning for me, but I still enjoy Halloween books. I just wanna pinch that seed's cheeks! Such a cutiepie – and yes, with a fabulous message. Thanks so much for this one, Susanna! The illustrations are amazing! That's what made me pick up the book in the first place! So beautiful! He's so cute, isn't he, Iza?! 🙂 And the illustrations in the book are so lush! Yes! Halloween candy 4-evah!!! LOL! Absolutely adorable art. The story sounds cute as well. I will definitely check this one out. Aw, poor little pumpkin seed! Brilliant idea! I love the “multipurpose” aspect of this book. Education in a fun, not-the-sole-purpose-of-the-book kind of way. And I'm very drawn to Zeltner's illustrations. The color palette, the expressions, the Swirliness of the sky. Beautiful! Aaahhh! I'm looking for some new Halloween books to add to my bag! This one looks perfect! A scary seed, indeed! I like to just eat pumpkins myself! What a sweet little tale for Halloween. Thanks Susanna! I'm with you … that little face is adorable! Thanks for scouting a lovely pumpkin pick. Little Boo is absolutely adorable. And oh, if only the little ones knew how lucky they are to be young. Patience is still a virtue I find myself struggling with even now as a grown up with my own little one…who's not so little anymore lol!! I find myself in a similar position, the waiting for the editor-impatience-is-killing-me position lol!